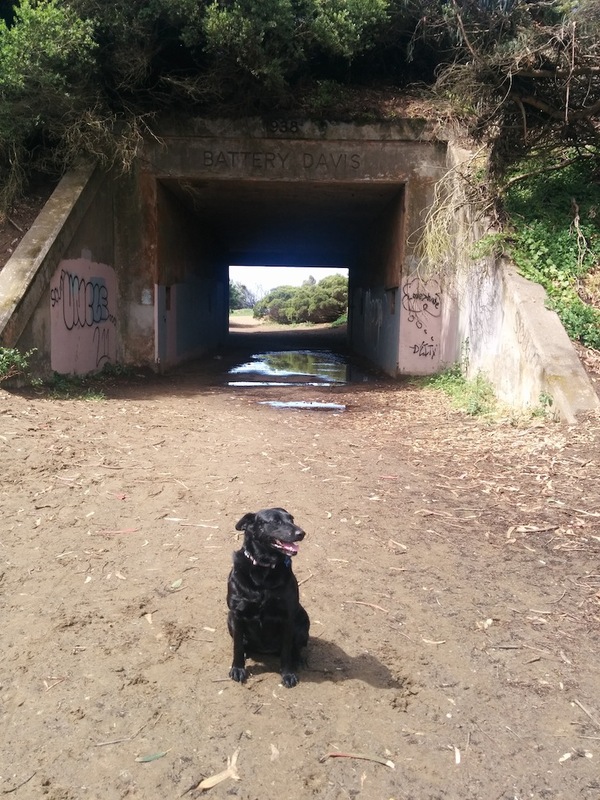 When we are in the San Francisco Bay Area visiting Willow’s Auntie and Grandpa (my sister and father) the easiest, quality dog romping spots in the East Bay are either Pt. Isabel Regional Shoreline, the Albany Bulb or Oyster Point. 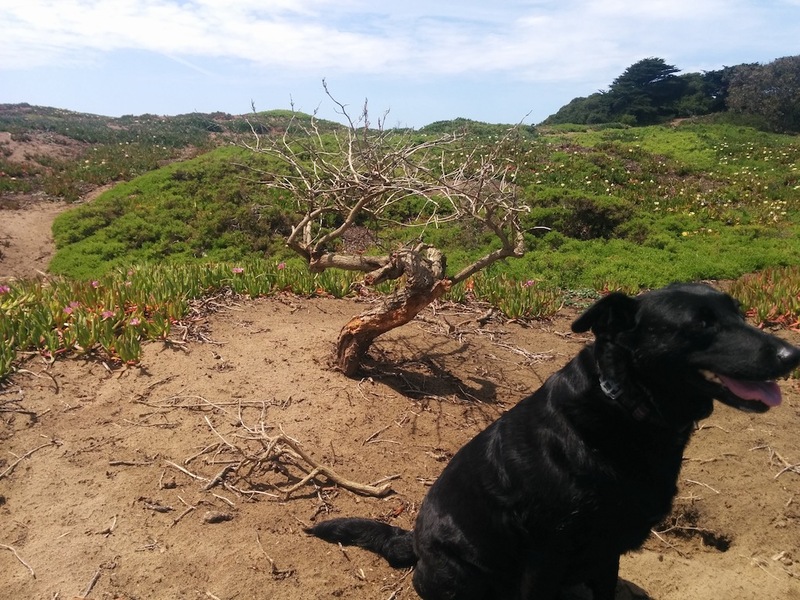 Every so often, on a romp at one of those places, we would come across someone who would ask us if we had ever been over to the other side of the bay to Fort Funston. We had not ever been and so finally decided to broaden our local horizons and head over there to take a look. Once you find a spot to park in the main lot off of Skyline Boulevard you have a choice to make. 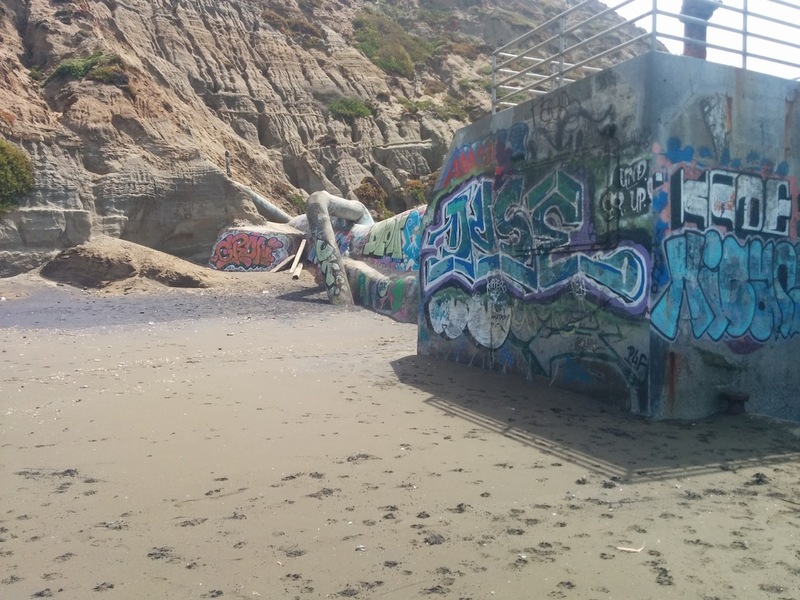 Do we go left, past the hang glider launching spots and down the sand ladders to the south end of the beach or head to the right, past the old artillery emplacements and eventually work your way down to the north end of the beach? On this occasion we decided to be bold and do both. We headed North first and decided to take the inland route instead of next to the bluffs. Soon enough we came upon the overly-engineered remains of one of the old artillery batteries that were there to protect the Bay during World Wars I and II. As fans of urban explorations and surreptitious look-sees of old, abandoned military and corporate installations we couldn’t help but rub our hand/and paws together in a conspiratorial and gleeful thought exercise of how useful it would be to have control over such an installation in a Zombie Apocalypse or other social upheaval. Lest you think we have an overly active imagination (it’s true, we do), the Centers For Disease Control thinks a Zombie Outbreak is a good way to get the Preparedness Point across to the general public. So there. After taking a look at the battery we continued North through some fun (for Willow) arbor overhangs where she found a few opportunities to keep the local, ground-dwelling fauna honest. We eventually came to an obvious sand path down towards the beach area and took that. Once down on the moist and compacted actual surf zone our walking became easier and Willow took the opportunity to go make some mad dashes into the waves. 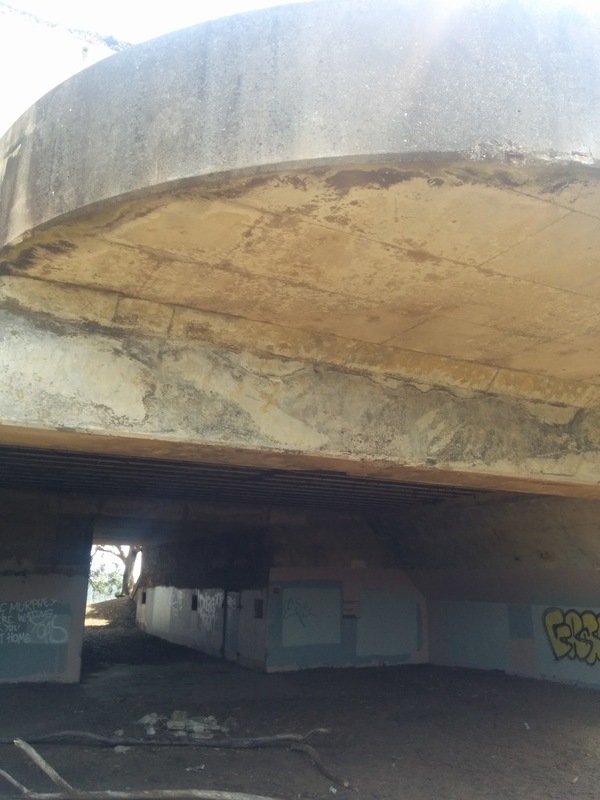 We came across this municipal concrete thing which we assume is the end of the line for the thousands of storm/sewer grates in the city of San Francisco (or the hundreds in the neighborhoods just East of Fort Funston) after they flush away excess rainfall and all the detritus of city life that ends up in the gutters. Those signs you see in gutters are not lying. Another View of the What We Think is the Citywide (or at least Neighborhood-wide) Sewer Grate Outflow Terminus. 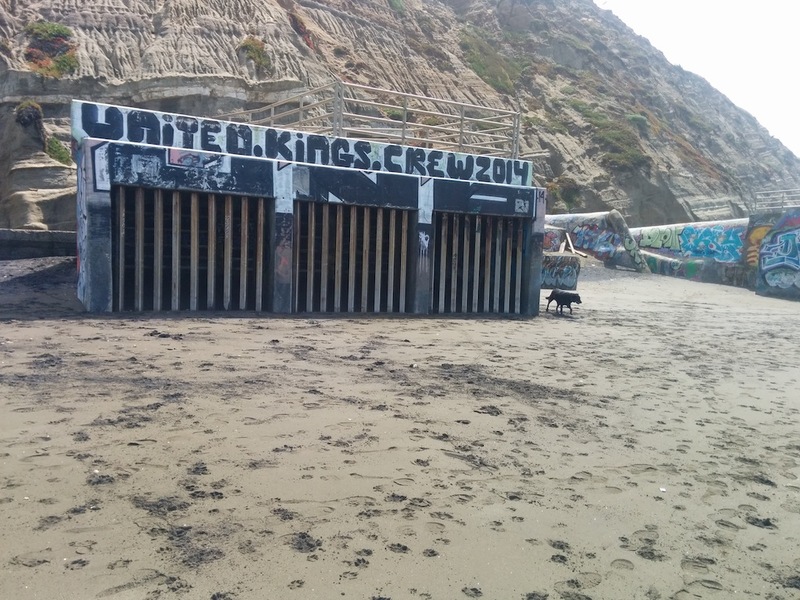 Apparently The United Kings Crew Wants to be the Bosses of it. We Should All Have Such High Aspirations. Since the sandy area in front of those grates is probably chock full of nasty chemicals and other gutter runoff I only let Willow have a quick sniff and then called her away so she could go romp in the Pacific Ocean some more and scour that nastiness of her little Princess Paws. We continued our trek South along the beach until we found an obvious path back up the bluffs and hopefully somewhat near our parking spot. 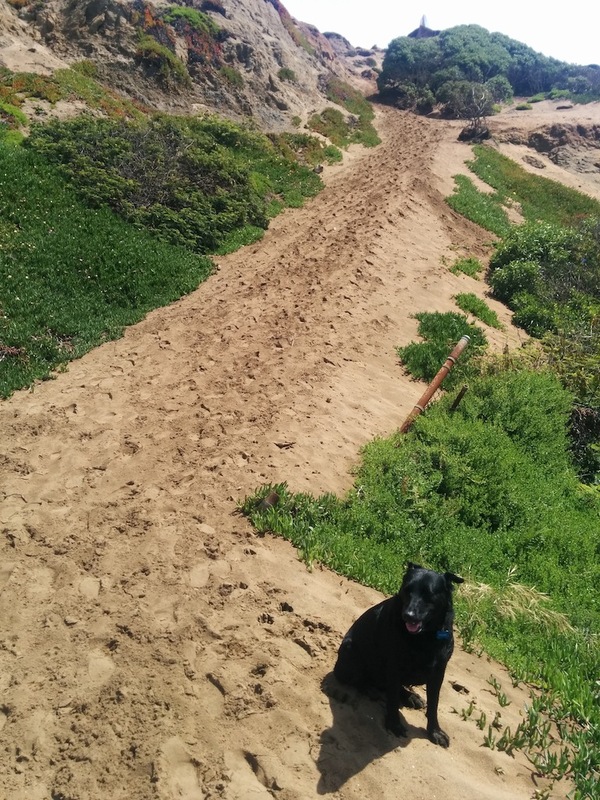 This ended up being the Funston Beach Trail path that has installed sand ladders which makes trudging up the bluffs substantially easier and does, in fact, exit very close to the hang glider launching sites which we were parked near. Once back at the car we had a quick water break. When we walked over to the faucet right near the entranceway to the observation deck (which was closed at the time for repairs and renovations) we were sad and annoyed to discover an adult dungeness crab sitting and doing poorly in the small puddle of fresh water under the faucet. The poor thing was hunkered down and trying to survive in an environment completely ill-suited for a salt water, gill-breathing organism. On top of that several people thought it was funny to allow their dogs to harass it with poking noses and smacking paws. Sadly, and for some odd reason, it is against the law to beat sense and knowledge into ignorant people with a baseball bat. Write your legislators. Even after our earlier trek we decided to see if we couldn’t save this little creature. So, back down to the beach via the Funston Beach Trail path sand ladder path that we had just trudged up minutes before. We ignored all the quizzical looks we were getting from people trudging up the trail as we walked past them, crab in hand. We could tell that the crab was still alive, barely, because it made several weak attempts to remove itself from our grasp during the bouncing trip down the sand ladders towards its rightful home. Once we got to the water’s edge we waded in and placed the crab into the water and gave it a few swirls to hopefully get some oxygenated salt water over its gills. It didn’t immediately perk up so we set it down on the sand under about a couple of feet of water and hoped for the best. If it recovered and survived, great. If it didn’t, we did our best and it would die in its correct environment and be recycled properly. We chose to believe it recovered and crawled off to do all those things crabs liked to do and lived out its life without ever coming across a hungry Sea Otter, Seal, Sea Lion or other crab-eating creature…or a crab pot. 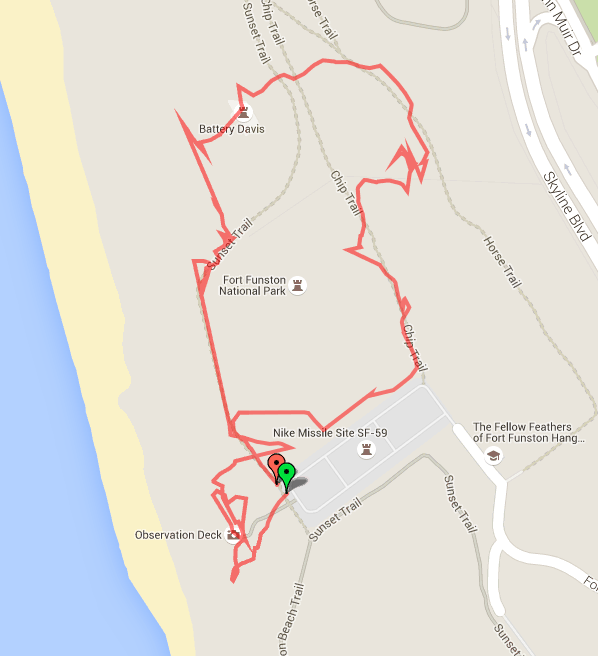 GPS Track Detail of Our Crab Rescue Trek. It Was Low Tide, We Were not Out As Far As It Looks. 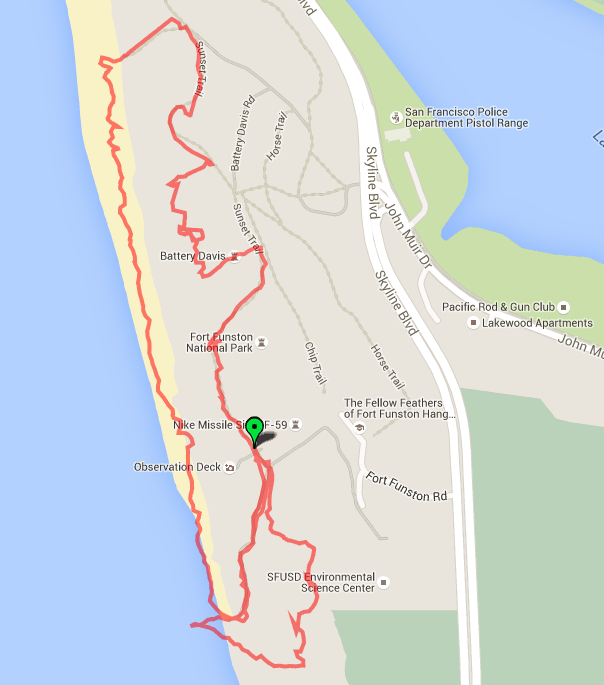 We decided to take a different path back up to the top of the bluff and ended up finding a trail much like the Funston Beach Trail but without sand ladders and noticeably steeper. Each step and the resulting slide backwards into the deep sand garnered us about a half step of progress so the going was slow and more difficult than either of us would have ideally liked. Our Path Back Up the Bluff After the Crab Rescue. Steeper Than It Looks. Once back to the car and heady off our successful crab rescue (this is what we choose to believe) our tired muscles seemed like not such a bad thing and so we decided to keep exploring the general area a little while longer. This time we first headed over to the most obvious hang gliding launch zone to see what we could see but found out it was far too windy for safe flights and instead stopped to talk to a few hang gliders who were waiting and hoping for the winds to die down. After our brief chat with the hang gliders we headed out past the parking lot and into some areas that we had bypassed on our earlier trek North. 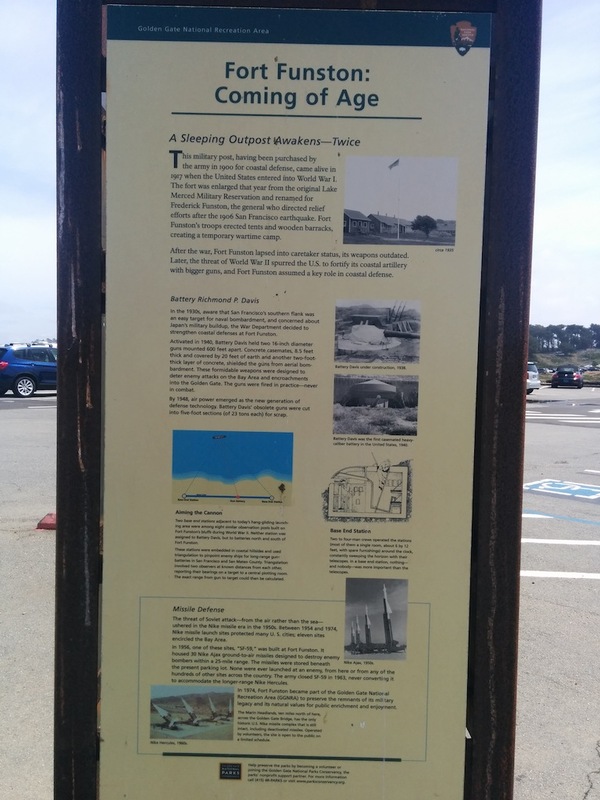 We found another Fort Funston Historical Information Sign and took a picture so you wouldn’t have to. Another picture we took in front of what looked like some bonsai trees we have seen before. 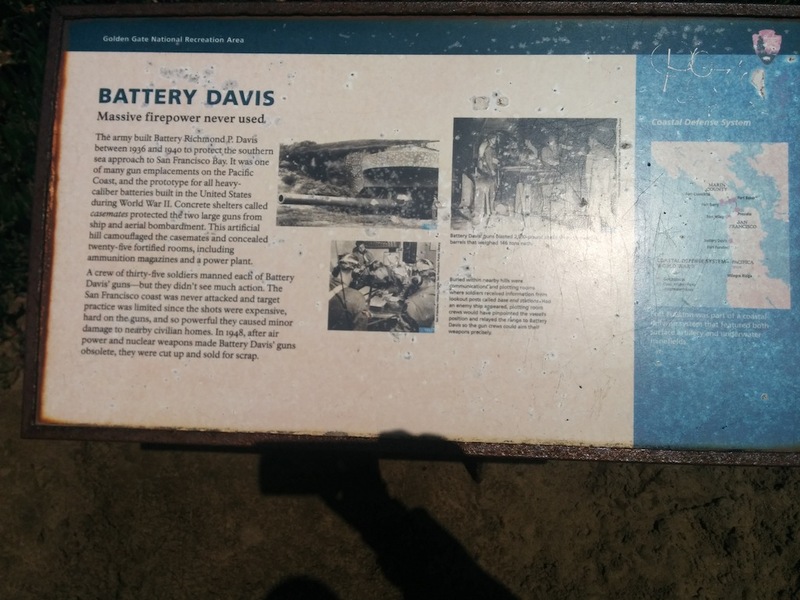 We continued our loop until we came back around to find the path that lead us right past the Battery Davis entrance earlier. 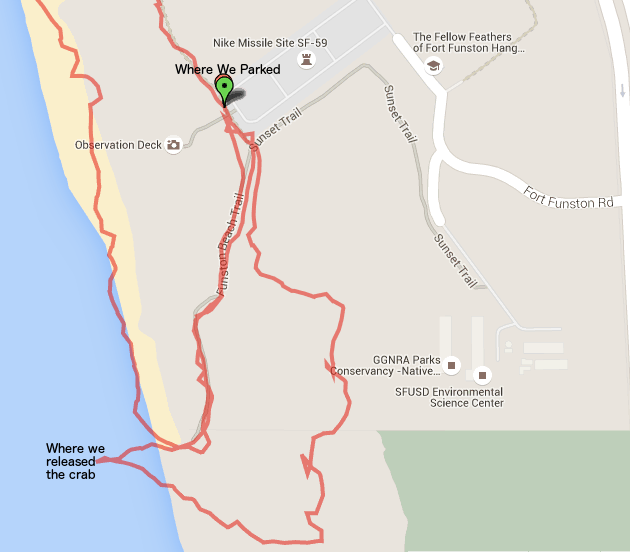 This time we headed out further West to the trail that ran parallel and near the bluffs and then cut back South towards the Observation Deck and the parking lot. Along the way we came across several crows having a ball. They were going out of their way to fly out from behind the protection offered by a sand dune and right into the gusts coming off the ocean. Each time they would fly above the dune they would get buffeted head over heels until they regained flight control and then would fly back into the protection of the dune’s wind shadow, compose themselves and then go right back and do it again. This was quite amusing for us as it obviously was for the crows. We spent 15 minutes or so watching the corvids goof off before we continued on back towards where we were parked. Once we got back to the car we had another drink and then saw that we had been there for about 5 hours which was more than enough to give Willow a great time at a new and exciting romp spot and to tire us both out. Now that we know how to get there we are looking forward to the next time we decide to visit the area. Our first visit gave us a quick overview of the area as we trekked around. 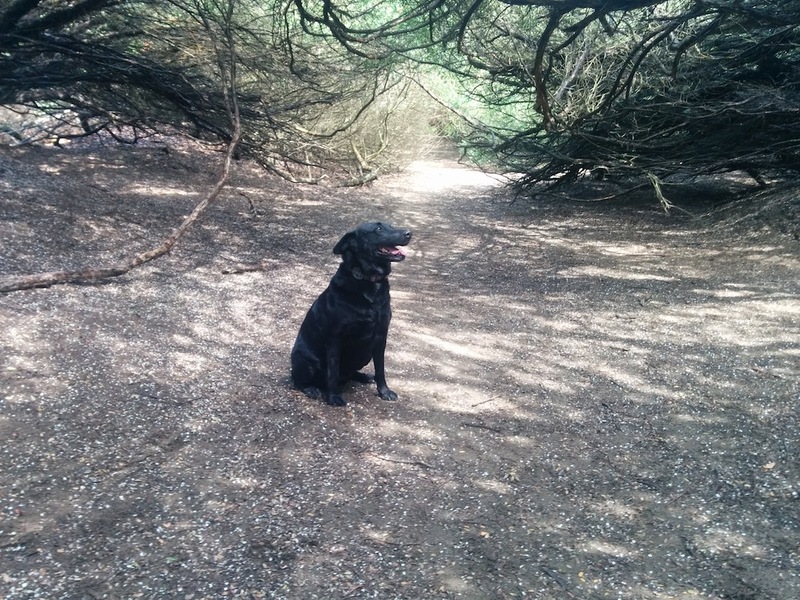 Now we know that on subsequent visits we will have many more acres to explore and keep uncovering new beauty and forge new paths as we continue on our adventures with dog. Hello there, You’ve done a fantastic job. I’ll certainly digg it and personally recommend to my friends. I am confident they will be benefited from this web site. Somebody essentially help to make seriously posts I would state. That is the very first time I frequented your web page and up to now? I surprised with the research you made to create this particular post extraordinary. Excellent task!